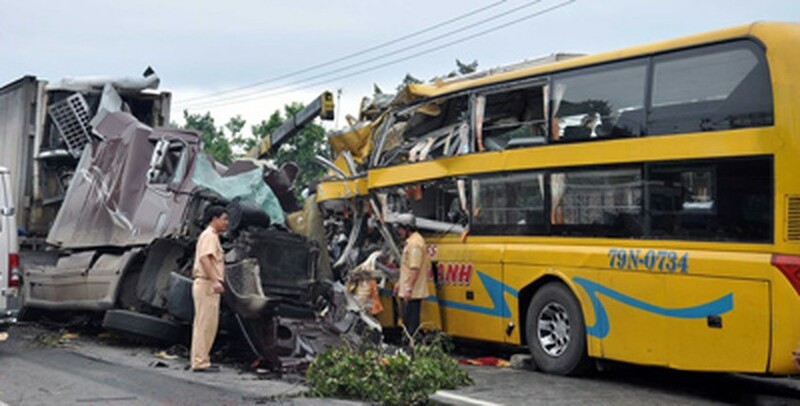 One bus carrying 40 passengers collided head-on with a truck on National Highway 1A in Quang Nam Province on September 29, killing two people and injuring 22 others, including both the drivers. The accident took place in Tam Xuan 1 commune of Nui Thanh district in Quang Nam central province at 4:00am on September 29. The bus was enroute from Nha Trang to Da Nang central province. All the injured were rushed to Quang Nam General Hospital for emergency treatment. The accident killed 35 year old Tran Thi Hai, who died immediately and 38 year old Ho Van Nghia, who succumbed to his death in Quang Nam General Hospital. The mishap also caused massive traffic congestion along parts of the highway for several hours. Nguyen Duc Hai, Secretary of the Party Committee of Quang Nam province and Le Phuoc Thanh, Chairman of the provincial People’s Committee visited the injured and provided financial support of VND2 million to each family of the dead victims and VND1 million to each of the injured. The People’s Committee of Nui Thanh commune also provided financial support of VND32 million to the accident victims.